Look at that little cutie in the water there swimming with her Ye ye. Just a couple days ago, he was a total stranger, as were the other 27 people she met this week. ... and thats just the IMMEDIATE family. ... my GOSH! That must be darned near 50 people in 5 days! 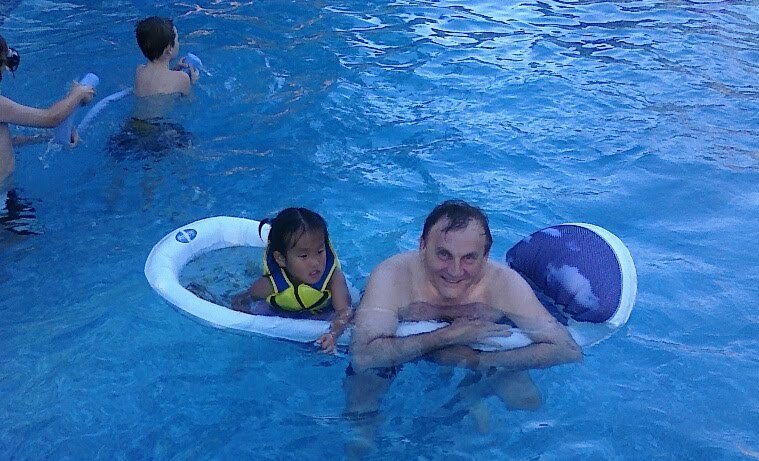 And she is still smiling and Swimming with Grandpa! Do we really understand that?! Seriously. Take any adult... or imaging yourself, travelling over 3000kms away from home, where you can barely speak the language, and every day you are meeting wave after wave of people... with no end... crazy! I think most of us would wind up in the fetal position crying somewhere in a corner. But not my Ping. :-) No sir. She takes it all in stride, maybe gets a little upset the odd time, but really, wow. I think she truly IS the bravest person I know! Even the 1st time we brought our Dear Daughter #1 (DD1) home to Winnipeg, she would not go to the Grandparents. She was far too shy! I remember the Grandparents having to wait to hold her. Wait for her to walk into the room by herself. Wait. Wait. Wait. It wasn't until she was almost 2 or 3 (maybe older) that she would start to really play with them. We only look at DD1 NOW, and go "Well, she is so well adjusted! Why can't they ALL be like that?" But she WASN'T always so well adjusted. No sir. Our DD1 would cry and cry and cry and throw a fit if her mother or I ever left her. There was only 1 poor Nursery Worker at Church who would put up with her (Thanks Mika!!! You ROCK!) and all her crying! Baby sitter? Forget it! So am I worried that maybe Ping isn't as "nice" as some think she should be, from time to time? Because I remember how our other children were, and I know Ping will be just perfect in time. This is just a person, being thrown into a situation which is overwhelming... Full stop. End of story. And meeting 50 crazy Winnipegers (trust me, they are crazy, you can tell, because they still live there) would TERRIFY anyone. Our eldest son was born and raised in Winnipeg, and was used to the family pretty quick. Our 2nd child, was 6 months old when we left Winnipeg. It took him a little while to get used to the family. And our 4th child, is already doing so great, and I am so proud of her! :-) She is talking, and playing, and swimming, and not being distant. I am so proud of ALL our kid'lets! Wow, I'm so proud of Ping. She is indeed a brave girl. It is amazing to see what has happened for her since last Nov. I'm also so proud of your whole family. She really has WOW'd people while she has been out visiting in Winnipeg. The family comes home Thursday... so I can't wait to get 'em all back home and settle back into a routine. We will have to hook up for everyone to meet your precious little one too! :-) Can't wait!